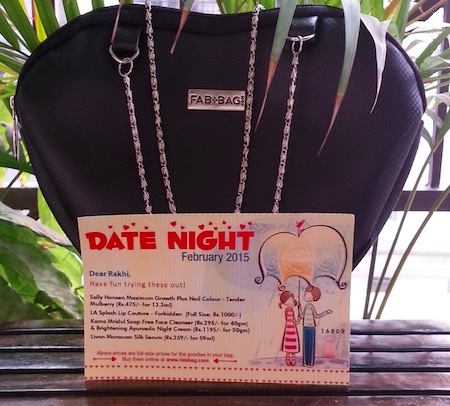 Hey everyone, today I’m sharing the review of my February Fab Bag. 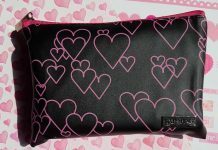 This month all the products came in a heart shaped black pouch with the silver chains. 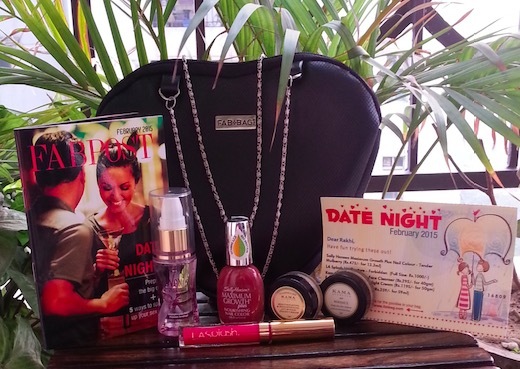 Inside the pouch there were 5 products from popular brands like Kama Ayurveda, Livon, Sally Hansen and LA splash. 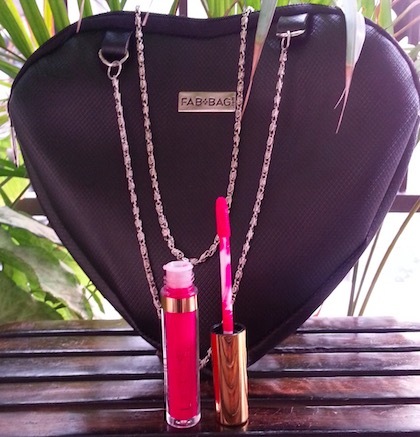 LA splash Lip Couture Liquid Lipstick : I received the shade Forbidden which is a gorgeous magenta color. 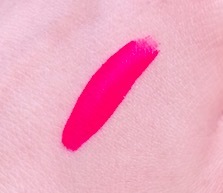 I just love this liquid lipstick, it is highly pigmented and shows intense color with just a single stroke. It looks satiny when applied but soon sets into matte finish. It stays on lips for good 7-8 hours without fading. 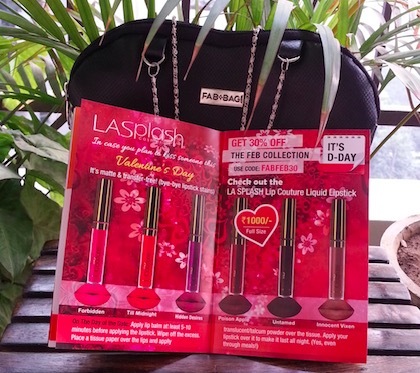 LAsplash Lip Couture Liquid Lipstick Price in India : Rs.1000. 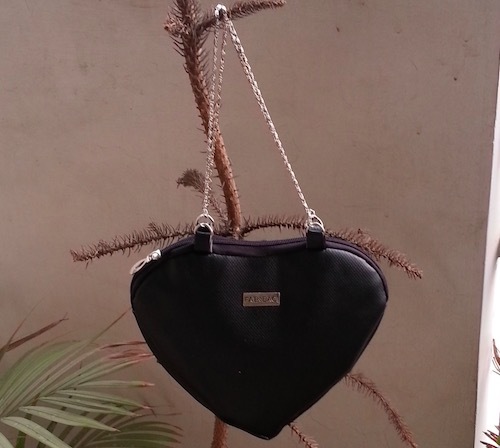 Click to read full review. 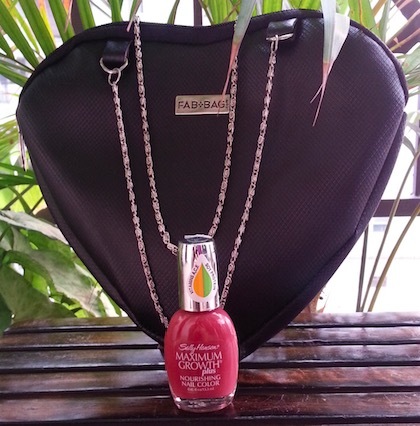 Sally Hansen Maximum Growth Plus Nourishing Nail Color : I got the shade Tender Mulberry 31 which is a pinkish berry shade. It is enriched with Vitamins A, C, E and Soy Protein which help in protecting weak & brittle nails. 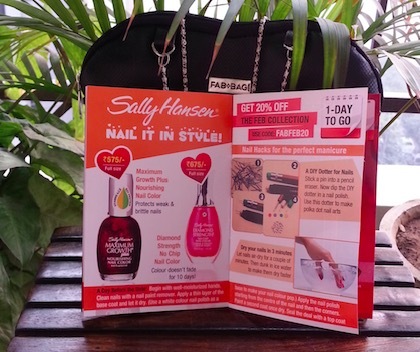 Sally Hansen Maximum Growth Plus Nourishing Nail Color Price in India : Rs.475 for 13.3ml. 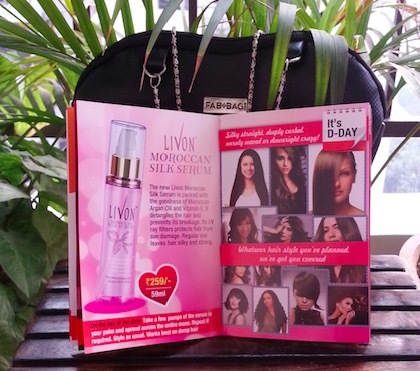 Livon Moroccan Silk Serum : I’m really very happy that the Fab Bag crew sent this newly launched Livon serum in Feb Fab Bag. 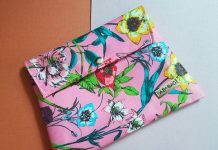 I received the smaller variant which will easily last for up to 30 usages. Livon Moroccan Silk Serum Price in India : Rs.259 for 59ml. 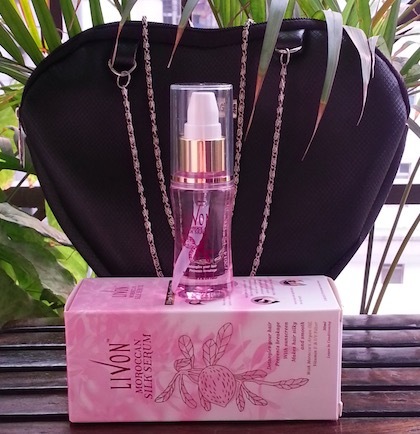 Click here to read the full review of Livon Moroccan Silk Serum. 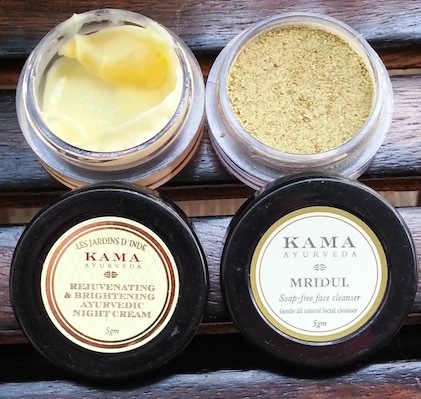 Kama Rejuvenating & Brightening Night Cream and Kama Mridul Soap Free Face Cleanser : Lastly I got two samples of Kama face cleanser & Kama night cream each. 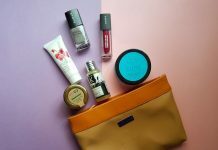 I tried both the products and really liked them. 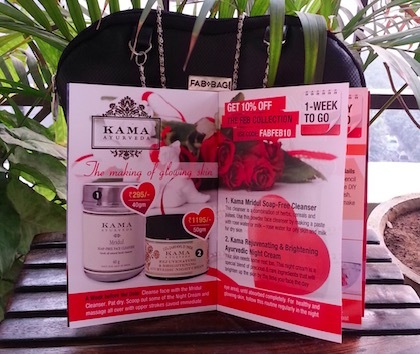 Kama Rejuvenating & Brightening Night Cream Price in India is Rs.295 for 40g and Kama Mridul Soap Free Face Cleanser Price in India is Rs.1195 for 50g. 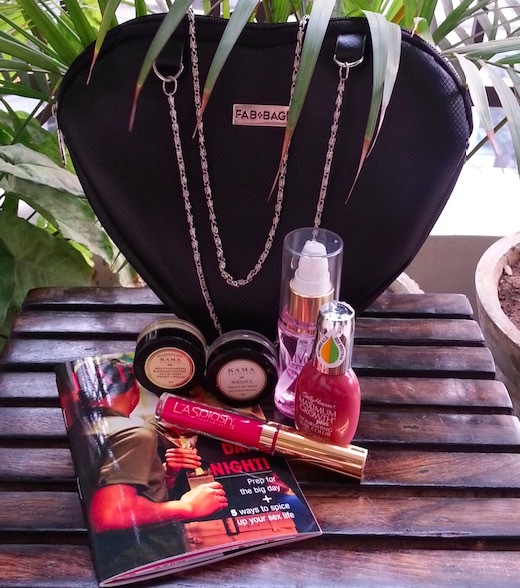 Overall I'm very happy with the February Fab Bag and loved all the products I received. 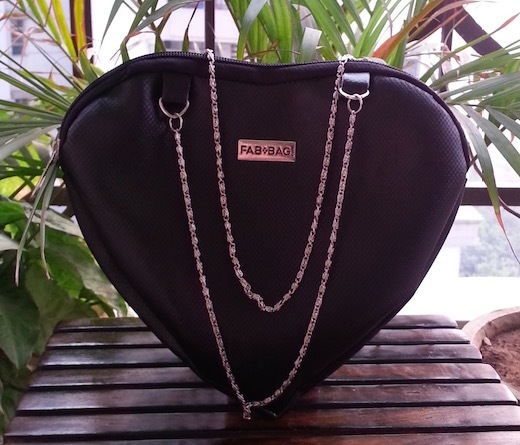 I strongly recommend Fab Bag to everyone.